In 1889 Sigmund Freud was still relatively new in his field. He’s what we’d call pre-freudian Freud. He was 33 years old, working as an assistant to another psychiatrist, and he hadn’t had any of his big ideas yet. Freud was mostly practicing hypnosis, which was a cutting edge but controversial treatment. One day Freud gets a new patient, a very wealthy woman named Fanny Moser. 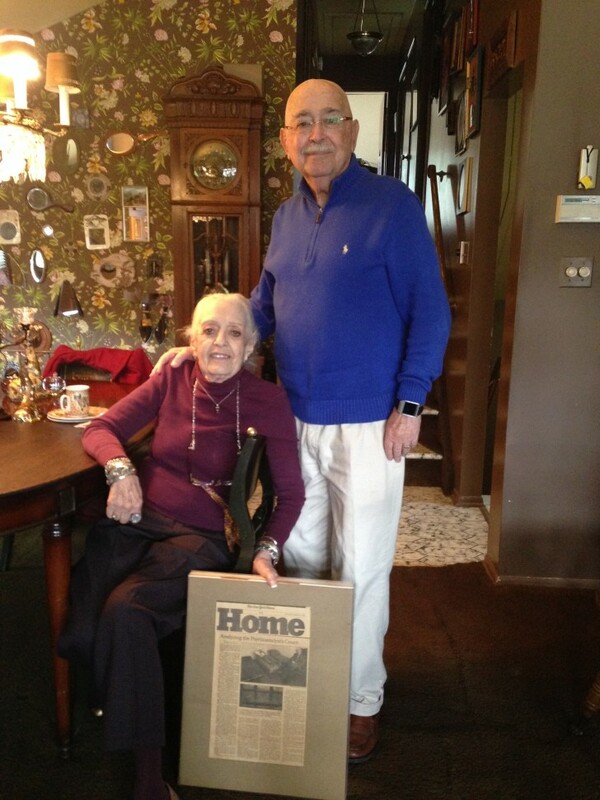 Moser was struggling from all kinds of ailments—hysteria, sleeplessness, pain, and odd tics, and she had lots of doctors. 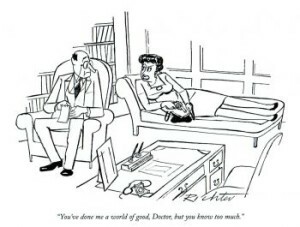 When Moser came to Freud, he would have her lie down on a couch, just like he did with his other patients. 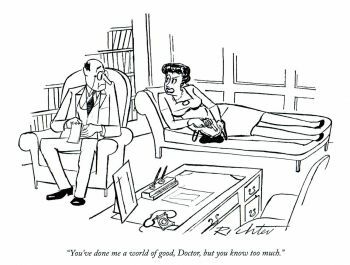 A lot of hypnotists used couches to get patients into a more relaxed state, but Freud especially needed it because he was kind of a clumsy hypnotist. 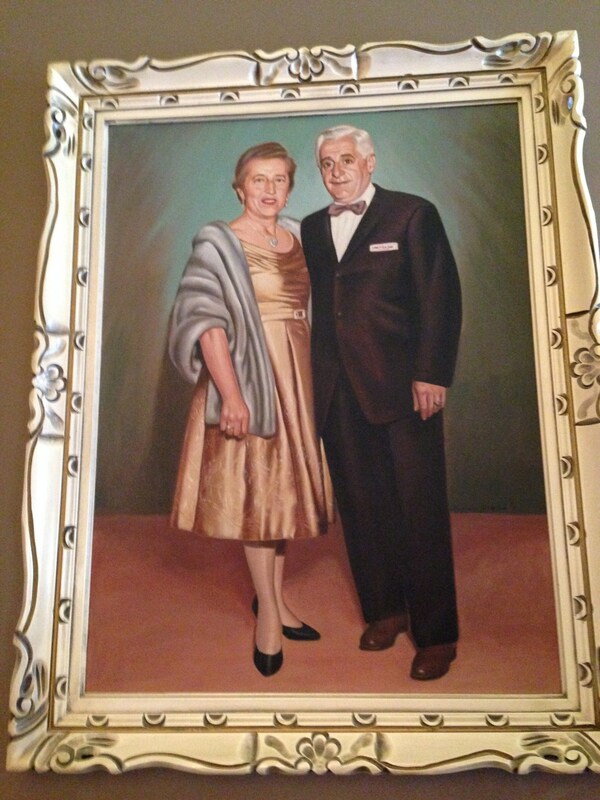 Freud would tell Moser, “you’re very getting sleepy” and she would insist that, no, in fact, she wasn’t. Instead, Fanny Moser wanted to talk. At first Freud would interrupt her with his theories, but Fanny wasn’t having it. She wanted to tell him her stories. That’s when the light went on. Freud realized that if you just let patients talk and don’t say anything, they will let down their defenses, and the unconscious will be revealed. This is the moment when the pre-Freudian Freud becomes the Freudian Freud. The Freudian Freud’s new techniques and theories for therapy would come to be called “psychoanalysis,” and it would be embodied, in practice and popular culture, by a single piece of furniture: the couch. 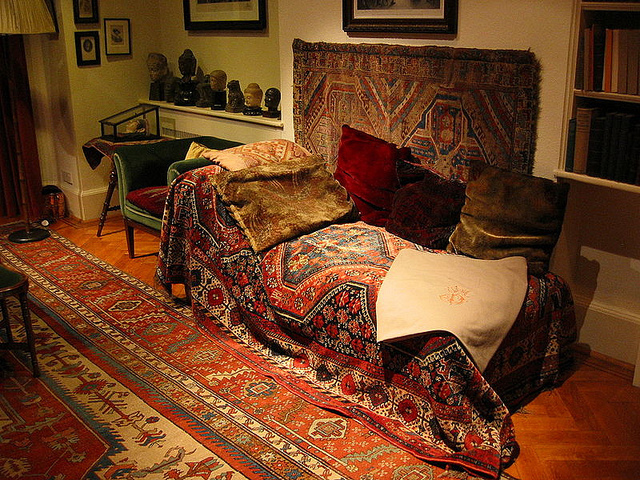 You can actually go visit Freud’s couch, which is on display in his last home, in London. Freud had the couch shipped from Vienna after fleeing the Nazis in 1938. Freud saw patients on his couch right up to his death a year later. Freud actually had a few couches, but the one we now associate with him was a gift from a patient, a Madame Benvenisti. She told Freud that if she was going to have her head examined, she might as well be comfortable, so she bought him a plain, beige, divan-style sofa – what some people might call a “swooning couch” –which Freud covered in exotic, red Persian carpets and piled up with velvet pillows. In any case, the couch took on such a central role in psychoanalytic practice that it started to mean good business for analytic couch manufacturers. Imperial Leather Furniture Company, in Queens New York, sold psychoanalytic couches like hot cakes, starting in the 1940s. Irving Levy patented a version of a psychoanalytic couch he’d designed with his business partner. Irving’s daughter, Alicia Brafman says he extremely proud of his couch design. Every time anyone walked into the store, he’d saunter up and say, “You know we make Freud’s couches.” Which of course, they didn’t. The couch they sold didn’t look anything like Freud’s exotic, cozy pile of cushions. These were sleek, low-to-the-ground, and free of buttons, cushions, and accessories that nervous patients could pick at. The Imperial Leather Furniture Company boomed in the 40s, 50s, and early 60s, which some have called the Golden Age of Psychoanalysis. Then in the late 60s things changed. People started to experiment with alternative therapies and the first generation of anti-depressants offered faster relief. 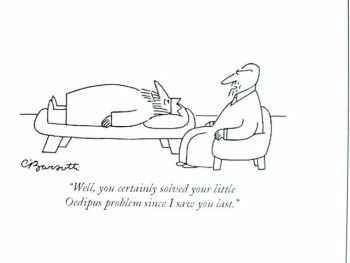 Traditional psychoanalysis fell out of favor. Analytic couch sales declined. But you wouldn’t know it from popular culture. It’s not just in the New Yorker. You see the couch all over popular culture. In the Sopranos, Tony Soprano spends a lot of time with his therapist. And even though he always sits in a chair, when the camera pans out, there’s a very typical brown analytic couch in the background, as if the set designer wanted to reassure our subconscious about what he was doing there. Tony Soprano in therapy. Image courtesy of The Columbus Dispatch. All those different iterations of the couch have compelled thousands of people to make the pilgrimage to see the original couch in London. The couch exemplifies how Freud revolutionized our understanding of the human mind. Freud has given us the id, the ego, the superego, the freudian slip, and a whole number of complexes, but beyond creating a vocabulary for the brain, he gave it a place to rest. To feel at ease. To lie down and talk. For this story, producer Ann Heppermann spoke with Michael Roth, president of Wesleyan University and Freud historian, Dr. Arnold Richards, a psychoanalyst who practices on New York’s Upper East Side, Bob Mankoff, cartoon editor of The New Yorker magazine, and Alicia and Fred Brafman of Imperial Leather Furniture Company, in Queens New York. It’s now Prestige Furniture and Design and it looks like they don’t have an analytic couch in their catalog anymore. These couches sometimes are called daybeds. After listening to this and a Planet Money podcast on computers vs humans performance when it comes to treating PTSD, I think there might be very good reasons for the analyst not to face the pateint. In the PM podcast the computer won because it did not show emotion or value judgement. The practice of sitting behind a patient may serve the same purpose, perhaps modern practices have lost this advantage by going couch less? There was a song in this episode featuring a Spanish woman and very melodic instruments somewhere in the middle. I think you might have replaced it with a new song as I can’t seem to trace it now. Could you let me know the title? Thanks and keep up the wonderful work! After recently watching the old BBC documentary called “The Century of Self” and seeing how Freud’s nephew systematically used his uncles insights into moving our nation from navigating each day based on our “feelings” and away from our “thinking” has pretty much brought me to the place where inspiring boring furniture is all I will attribute to Freud. We don’t even say anymore, “what do you think about this or that?” …we now say, “how do you feel about this or that?”…I don’t know about your feelings but mine lie, deceive and often betray…not exactly the bunch I think wise to look to for advice. But a fascinating story…thank you.